It’s Spring! We made it… April! Ahhh…. This is one of my most favorite times of the year… (ok, yes, also summer and fall :-) ). 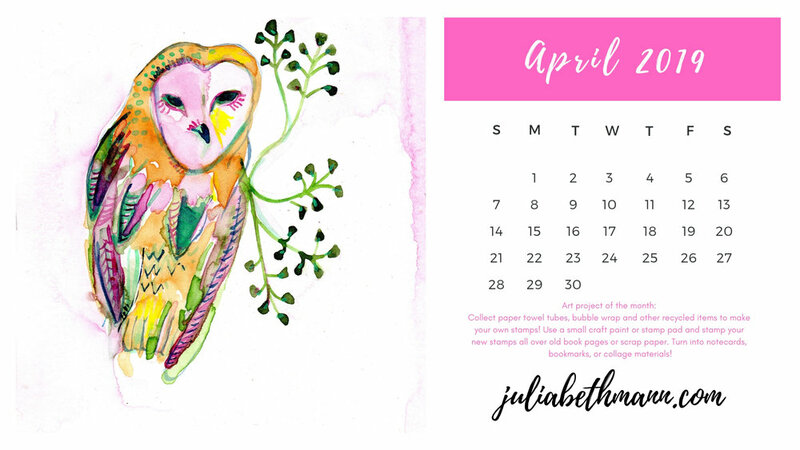 For this month I’m adding one of my favorite owl paintings to the calendar printable. I saw an owl at Plum Island State Park a few weeks ago and have been drawing owls ever since. To print, click on image and right click to “Save Image.” Save to your hard drive and go to where it saved. Open file and select print. In your printer menu, you will want to check are that it is printing “full page” and/or that it will “shrink to fit.” For me, both work. Let me know how it works for you! Also, check out the little crafty tip on the calendar this month! I hope you enjoy and have a wonderful April!